Facebook Event – Write to Irom Sharmila Chanu. Organized by Pan Manipur. Have you ever wondered how you will help Irom Sharmila Chanu , but confused about how ? 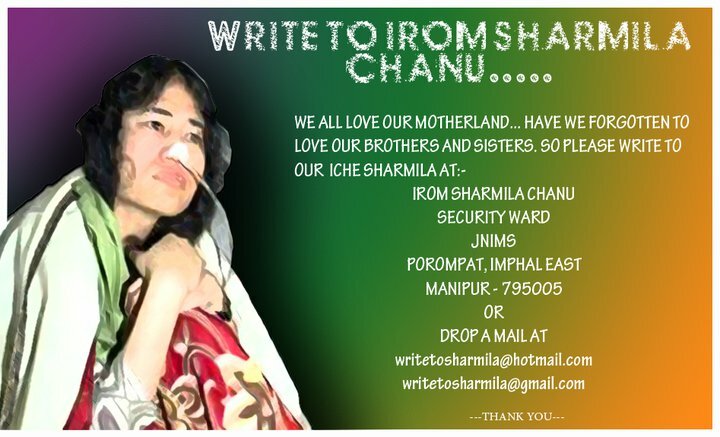 Pick up a pen and a paper and START Writing “letters” to Irom Chanu Sharmila instead ..
Our Eche (sister) is very lonely out there … Let us make our Ichey smile . Write to her,make small gifts , paintings ,poems ,anything ..
Let us start Writing letters to her.. DONT PROCASTINATE ..
We can take the print outs and post the mails.